"The fruitcake was THE BEST FRUITCAKE IN THE ENTIRE UNIVERSE. And I don't even like fruitcake. A thin slice was like a super deluxe gourmet Fig Newton for adults. I loved it. Doug ate most of it when I wasn't looking." 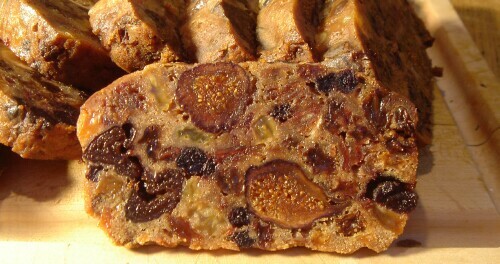 It started out as the "DARK FRUIT CAKE" recipe from The Joy of Cooking (the 1962 edition), but over the years I removed the ingredients I didn't like (citron and nuts), added ones I preferred (figs, dates, and other fruits), simplified the procedure, and added whiskey to the final product. The dried fruit can be whatever you like; I tend to use 3-4 pounds of raisins and currants, a pound each of dates, figs, and a pound or two of prunes, cherries, berries, or whatever I can find cheap. If you put in a lot of tart fruits, you might want to increase the brown sugar a little to compensate. The red wine can be anything you have (or port, or sherry, or fruit juice ...). I might almost say "the whiskey is optional" except I just can't imagine this recipe without it. This recipe makes about 12 pounds of cake. I bake it in disposable aluminum loaf pans, which come in two sizes: a small one that holds about 1 pound, and a large one (almost full bread loaf size) that holds about 2 pounds. These are sturdy enough to wash and reuse year after year. Put 1 cup of the sifted flour into the bottom the paper bag. Cut up the fruit if desired (remove pits if necessary; it helps if you wet the scissors), and put it into the bag. Close the bag and coat the fruit with flour by shaking vigorously (this keeps the fruit from sticking to itself, and helps the batter coat it). Put 1 pound of butter in a pan over a low flame to melt (save the 1/2 stick for later). Mix 3 remaining cups of flour and the spices (but not the brown sugar); a sifter works well for this. Once the butter is melted, mix in the brown sugar. Put butter/sugar, flour/spices, eggs, and wine into a big bowl and mix with the electric mixer (you didn't forget about the mixer, did you?) until completely smooth. Melt the 1/2 stick of butter and brush it on the loaf pans. Fill the loaf pans with the batter (it's stiff, so push it down). How long to bake? The original recipe says "3 to 4 hours", but that's at 275° (which the original recipe said); at 300° I've never had to go more than 2 hours. But keep an eye on them; when the tops look firm, pour some whisky over them; repeat this every 15 minutes until the edges start looking a little crisp, then take them out. Pour some whiskey on them as soon as they come out of the oven, and at least once more later (once they don't look moist anymore). Here are the details of the 2006, 2007, and 2010 production runs.